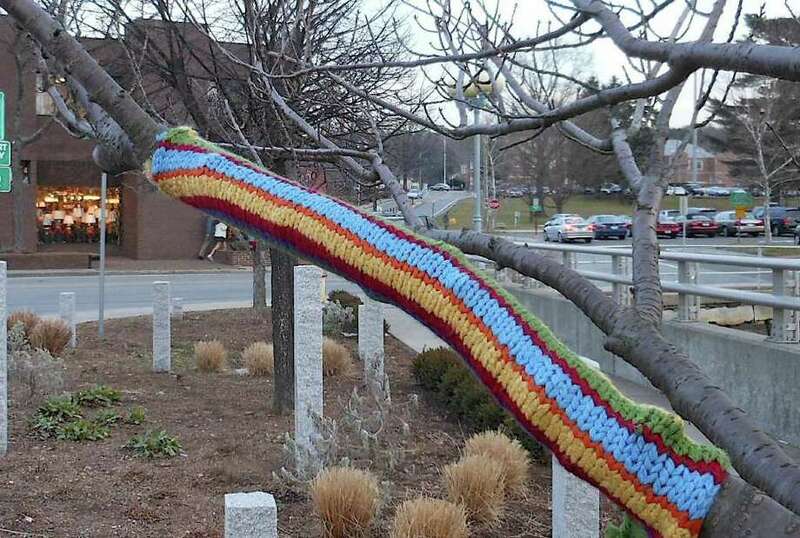 Mysterious muffler: A branch on a tree in a small garden at the corner of Post Road East and Jesup Road in downtown Westport has been wrapped with a colorful crocheted cuff by an unknown benefactor. It's a classic whodunit: the case of the mysterious crocheted mufflers recently wrapped around trees and sign posts in downtown Westport. A tip from Weston artist Mercedes Arensberg drew attention to the colorful warmers. The first mufflers were spotted in a small garden maintained by the Westport Downtown Merchants Association at the corner of Post Road East and Jesup Road. Branches of two trees as well as the trunk of one were adorned with sleeves crocheted with the purple, orange, green, light blue and red yarns coverings. These colors were arranged as bands, squares or stripes in each case. A sign pointing to Westport's Main Street in the same garden patch was given a knit wrap. Asked if Westport's Beautification Committee were responsible for the mufflers, Angela Trucks, the committee's co-chairwoman, although amused, said the group had no involvement. The leader of the Downtown Merchants Assocation, Bob LeRose, owner of Bobby Q's restaurant, also disavowed any knowledge as well. Longtime downtown merchant, Lee Papageorge, owner of Oscar's Deli, likewise had no clue. "They must have been placed very recently," Papageorge said. "I go there (to the garden) every day and didn't notice them." Papageorge guessed they could have been the work of anti-war protestors who gather in the area regularly or perhaps groups doing knitting for people in need. At Max's Art Supplies, Rita Englebardt said she believed it was a "spontaneous message, a take-off on art placements in New York perhaps." She added, "Maybe it's even Christo-inspired."